BEST AUDIOBOOKS Young Adult ARISTOTLE & DANTE DISCOVER THE SECRETS OF THE UNIVERSE Benjamin Alire Saenz From the first word of this rich recording, Far Far Away envelops the listener. Both the production quality and the performance are superb. W. Morgan Sheppard's voice embodies the haunting aspects of this dark tale. Sheppard's narration is a vehicle of otherworldly transport that truly takes the listener far far away. Will Patton's narration of The Dream Thieves enriches this contemporary fantasy, helping to provide verisimilitude to the setting of Henrietta, Virginia, a town steeped in magic and mystery. His drawl adds authenticity as he hints at the social divide between the prep school boys and those less fortunate. 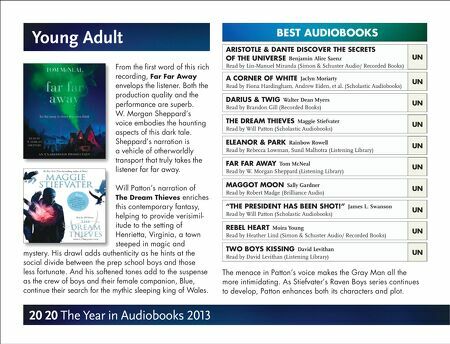 And his softened tones add to the suspense as the crew of boys 20 20 The Year in Audiobooks 2013 UN Read by Lin-Manuel Miranda (Simon & Schuster Audio/ Recorded Books) A CORNER OF WHITE Jaclyn Moriarty Read by Fiona Hardingham, Andrew Eiden, et al. (Scholastic Audiobooks) DARIUS & TWIG Walter Dean Myers UN Read by Brandon Gill (Recorded Books) UN THE DREAM THIEVES Maggie Stiefvater Read by Will Patton (Scholastic Audiobooks) UN ELEANOR & PARK Rainbow Rowell Read by Rebecca Lowman, Sunil Malhotra (Listening Library) MAGGOT MOON Sally Gardner Read by Robert Madge (Brilliance Audio) "THE PRESIDENT HAS BEEN SHOT!" James L. Swanson Read by Will Patton (Scholastic Audiobooks) REBEL HEART Moira Young UN UN UN Read by Heather Lind (Simon & Schuster Audio/ Recorded Books) UN TWO BOYS KISSING David Levithan Read by David Levithan (Listening Library) UN and their female companion, Blue, continue their search for the mythic sleeping king of Wales. The menace in Patton's voice makes the Gray Man all the more intimidating. As Stiefvater's Raven Boys series continues to develop, Patton enhances both its characters and plot.